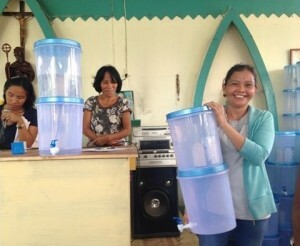 Basic Water Needs B.V. is happy to announce that our Tulip water filters are now available in the Philippines. Southlight Technologies and Distribution Inc. is the official distributor of Tulip products in the country. The first container filled with thousands of Tulip Table top filters and spare parts is on its way to Manila. Not only will Tulip filters become available in local shops, from now on there will also be local stock for emergency situations. In a country consisting of 7,107 islands which are prone to storms and earthquakes, being able to deliver safe drinking water products quickly and safely can save lives. Having local stock available will substantially reduce delivery time and costs. The products have been certified and approved by the Philippines Department of Food, Health and Drug administration. Even with the muddy water of the Pasig River, the Tulip filters were able to provide safe, clear and good tasting water. Southlight Technologies and Distribution Inc is supported by Borromeo & Rullan-Borromeo Law Offices to ensure compliance with legal and technical requirements within the Philippines. Signing the contract between Basic Water Needs B.V. and Southlight Technologies during the Dutch Trade Mission in the Philippines.